Good CSR policies drive corporate change for the better. With well defined objectives and measurable targets, your CSR Accreditation will provide the foundation for steps towards running a more sustainable and ethical business. Achieving CSR Accreditation is a visible testimony of excellence in CSR. The accreditation helps you integrate social, environmental, ethical, human rights and consumer concerns into your business operations and strategy and it provides you with a real competitive advantage. The establishment of a CSR Accreditation is a crucial component of a company’s competitiveness and something that should be led by the business itself. For companies, the overall aim is to achieve a positive impact on society as a whole while maximising the creation of shared value for the owners of the business, its employees, shareholders and stakeholders. 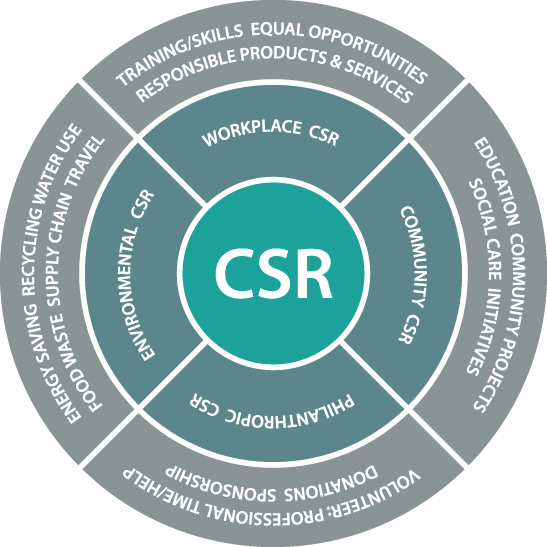 CSR Accreditation looks at your organisation’s impacts on employees, suppliers, clients and communities / charities and helps you develop an audit / report which forms the basis of your CSR road map. Upon successful Accreditation we will supply you with an Accreditation Pack and Logo Tool-kit for display across all your brand touch-points such as printed materials, websites and vehicles. CSR Accreditation is based on an assessment of an organisations full range of CSR activity and will also require evidence that the management is committed to maintaining acceptable standards during the period of Accreditation. A successful audit of the policies and structures regarding responsible business practice that the applicant actually has in place. No matter what size your business, large or small, you submit an application based on the ‘Four Pillars of CSR’ and the assessment guidance notes found here. The applicant paying the specified Accreditation application fee. CSR applications are charged based on organisation size: Sole Trader (1-2 Employees), Small Business (<50 Employees), Medium Business (51-250 Employees) and Large Business (251+ Employees). The full report is considered by the Accreditation Panel which decides to award, defer or refuse Accreditation. Achieving accreditation endorses your organisation’s management of CSR practices and along the way, the accreditation will also provide you with a gap analysis and a roadmap for your sustainable journey. All successful CSR Accreditation’s will be automatically entered into the International CSR Excellence Awards.